William Horton of London purchased a large proportion of the Chetwode family estate in 1799, thus becoming the Lord Of The Manor for Middleton Cheney. The Horton family became considerable landowners and had extensive interests in Stocking Frame Work and the development of elastic hose. George Herbert (1814-1902), remembered the Middleton silk stocking industry in his book entitled, "The Shoemakers Window. 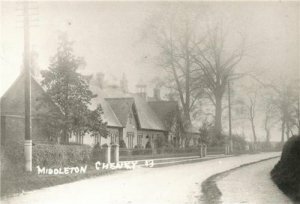 "- "The silk stocking making used to be largely carried on at Middleton Cheney by the Hortons. Since I can remember there was a loom in most of the cottages for the purpose and now there is not one. The last I can remember was worked by Bill Shrewsbury and he was after keeper for Mr. Henry Tawney when he became insane. I knew Shrewsbury well, he being a musician and used to play the key bugle in the Middleton Band. He also used to play the flute and to amuse Mr Tawney by playing with him, Mr Tawney playing the violin (or pretending to do so), during his insanity" (Mr Henry Tawney was the Mayor of Banbury in 1835/6 and unsuccessful Parliamentary Candidate). William Horton's daughter, Mary Ann, was responsible for the building of The Holt in the village (now the Tenlands estate) and although this building had a date-stone of 1865 this was probably the year of the completion of an extension. Sadly The Holt was demolished in 1973 although the coach-house and the stables were renovated and enlarged. Mary Ann Horton did an enormous amount of good for the poor of the village, especially the children. She contributed a large amount of money for the restoration of All Saints Church in the 1860s and was responsible for the Almshouses being built in 1863 – originally for the workers on the Horton Estate. Victorian Almshouse were customarily made externally imposing simply because that was how the benefactors who paid for their erection wished it and those at Middleton are no exception. Note the solid, Tudor-type porches with steeply pitched roofs. The Victorians in general never tired of what they thought of as the spirit of old England, by putting up imitations of buildings in the Tudor style, but they made their doors and windows larger than the older builders had. They applied rich Tudor detail to buildings whose scale would never have merited any decoration at all at an earlier date. 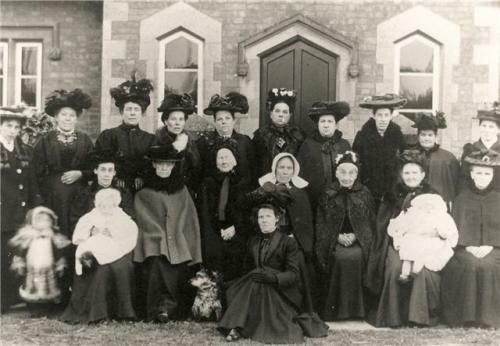 The ecclesiastical look was thought suitable for the recipients of charity! The first occupants of the Almshouses were paid ten shillings (per married couple). A single man received seven shillings and a single lady, six shillings. An extra five shillings was given at Christmas although the Committee could allocate the seasonal gift in the form of coal or clothing should they so wish. Men had to be at least sixty years of age, women fifty-five, except in the case of married couples where the wife only had to be fifty. No person was eligible as an almsman unless he had been employed as an agricultural labourer on the Middleton estate for five years. Mary Ann Horton also bequeathed the money for the Horton Hospital in Banbury, with the proviso that there would always be at least one bed available for a resident from Middleton Cheney.